The great Adult Magazine led me to the works of American author and punk icon KATHY ACKER (1947-1997) these past few days. Among many impressive books, novels and essays, I’m particularly interested in what she wrote about bodybuilding, a practice she dedicated herself among writing, tattooing and body modification. If you want to know more about KATHY ACKER, I suggest you to read her portrait by CHRIS KRAUS for Spike Art Magazine. 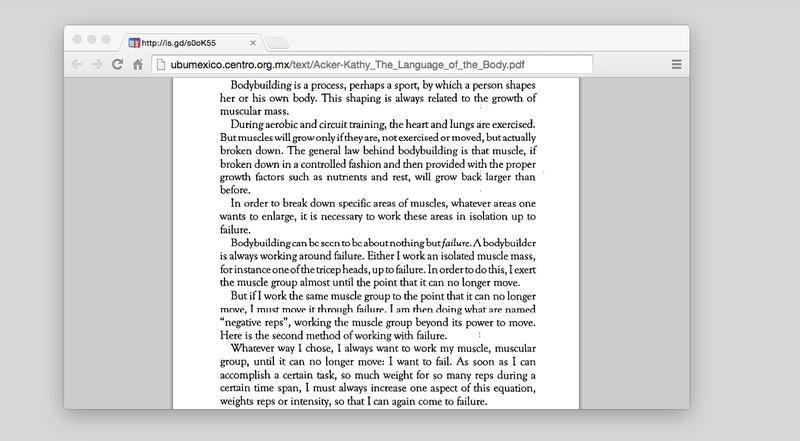 Make sure also to read the whole essay Against Ordinary Language: The Language of the Body (1992) from where the excerpt above comes from via http://ubumexico.centro.org.mx/text/Acker-Kathy_The_Language_of_the_Body.pdf . In the same theme, I really recommend to visit the group exhibition entitled Inhabitations, Phantasms of the Body in Contemporary Art that is on view at the Kunsthaus Aarau until August 2, 2015.